Born: 12 February 1758, Fulneck, Yorkshire, England. Died: 6 May 1836, Liverpool, England. Christian Ignatiuus Latrobe, Moravian minister and composer, was the eldest son of Benjamin Latrobe, superintendent of the Moravian congregation in England. The Moravians, known as the Unitas Fratrum, or United Brethren in England, were originally a German protestant sect. In 1771, at the age of thirteen, Latrobe was sent to Germany to study at the Moravian school at Niesky and subsequently at the Moravian seminary at Barby, near Magdeburg. After completing his studies in 1779 he remained as a high school teacher, the organ being his principal musical instrument. He returned to London in 1784 and was ordained four years later. From 1787 he was secretary of the Moravian Brethren's Society for the Furtherance of the Gospel to the Heathen, a post he held until 1834. In 1790 he married Hanna B. Syms. They eventually had six children, one of whom, Charles J. Latrobe, later became Lieutenant-Governor of Victoria, Australia. The Moravian mission station at Baviaanskloof, renamed Genadendal in 1806, had been established in the Cape Colony north of Caledon as early as 1737. In 1814 Moravian settlers at a second settlement, Groenekloof (Mamre), encountered difficulties with the Governor, Lord Charles Somerset, who was antagonistic towards them. Latrobe sailed for the Cape in October 1815 to resolve the matter (which he did) and to establish a third settlement. He arrived at the Cape on 24 December 1815. Early in March 1816 he set out for the interior, accompanied by government surveyor John Melvill, on a journey that lasted 68 days. They travelled via Genadendal, Swellendam, Cape St Blaise and the Uitenhage district to the Little Fish River. He selected a site for the third settlement, named Enon, on the Witte River (Witrivier), a tributary of the Sunday's River. In Attakwas Kloof, north of Mossel Bay, he saw screw-like fossils [presumably gasteropods from the Bokkeveld Group], while at Addo Drift, on the Sundays River, he also noticed fossils [bivalves of Cretaceous age from the Sundays River Formation]. His friend, Reverend C.H.F. Hesse* showed him the slates and granites at Sea Point. He departed from the Cape on 17October 1816. After his return to England Latrobe published A journal of a visit to South Africa, ... (London, 1818). A second edition appeared in 1821, while a facsimile reprint was published in 1969. Both a German (1820) and a Dutch (1823) translation were prepared by Reverend Hesse. The work is an informal account, written mainly for his children, and was not his formal report to the United Brethren. It provides an impartial view of conditions at the Cape at the time. Describing mainly his day to day activities, it includes some notes on the geography, geology, and natural history of the colony. A map is included which depicts the coastline fairly accurately, though most of the detail is confined to the area along Latrobe's route south of the coastal mountains. Latrobe was a large man of distinguished appearance and various talents. He composed anthems, chorales, and some instrumental works and was also an important musical editor, best remembered for his monumental work, Selections of sacred music from the works of the most eminent composers of Italy and Germany (6 vols, 1806-1825). 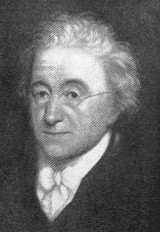 He also wrote, translated or edited several religious books, for example, in 1794 he translated History of the mission of the United Brethren among the Indians in North America, by George H. Leskiel, and in 1820 he translated and edited the Narrative of a visit made in 1819 to the new missionary settlement of the United Brethren, Enon, on the Witte Rivier, in the district of Uitenhage, South Africa by Reverend H.P. Hallbeck. Latrobe, C.I. A journal of a visit to South Africa with some account of the missionary settlements of the United Brethren, near the Cape of Good Hope (2nd ed.) London: Seeley, 1821.